Charity Fun Golf for Non-Golfers! 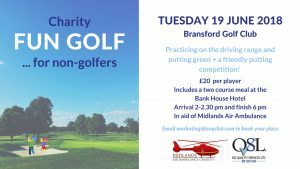 Charity Fun Golf day for non-golfers on the 19th June at Bransford Golf Club at the Bank House Hotel. The day includes practicing on the driving range and putting green followed with a friendly putting competition! The cost for the day is £20.00 per player. Including a two course meal at the Bank House Hotel & the all important donation to Midlands Air Ambulance Charity. This is a half day event. Arrival between 2-2.30 pm and finish approximately 6 pm. Email marketing@isoqsltd.com to book your place!